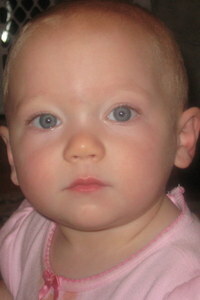 Abigail: My beautiful baby girl. You were once so teeney and fragile, and now you are healthy and perfect. While once we were afraid to touch you, now you are delicate, yet strong. You are my most reserved baby. You seem to calculate your moves very carefully before deciding where to go, who to look to. You used to be a little more fussy, a little more anxious than the other two, but now you are very calm and quiet. You watch everything around you and only seem to make noise when you have something important to communicate. You don’t babble much, but I know you will when you’re ready. You are very smart and you know how to get attention. We think you were meant to be a singleton, some days – you prefer your solitude, you don’t care for the other babies to be crawling in your space, you don’t like it when they touch you or the toys you’re playing with. You respond better to adults when you are the only baby in the room. You seem happiest when you have one-on-one time with an adult and the other babies are in another room. You are my pickiest eater, but you certainly don’t seem to be suffering for it. You were the second to roll over, the first to stand, the second to crawl, and you have absolutely NO interest whatsoever in walking. You have seven teeth, one more than each of your siblings. You were, in fact, the first baby to get teeth. You used to be very stingy with your smiles, but now you freely give them away and you giggle for us, too. You have ten perfect little fingers, and ten really long toes to go along with your really long skinny feet. I wonder if perhaps someday you’ll be tall, like your father, though for now, you (like your brother and sister) are short. No matter, because to me, you’re perfect. I just love you so, so much my beautiful little girl. 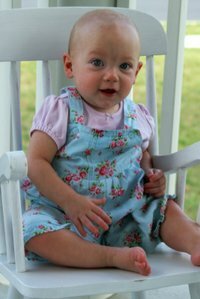 all 3 of the babies look so adorable in those rocking chair photos! their beauty is captured so well in these photos. are they taken from a professional photographer? I absolutely cannot believe they’re a year. I remember when i first started reading, when you first found out you were having triplets! Happy birthday(s)! How can it be that they are already ONE?! wow – they’ve all grown so much and look so great! Just this morning, I was telling my dev psych class how MUCH infants grow in the first year. I should’ve showed these pics to demonstrate!